Kristie and Kirstie Bronner, now 24, served as co-valedictorians at Spelman College in 2013. After making history two years ago as the first twin co-valedictorians at Spelman College, Kirstie and Kristie Bronner continue to break new ground as they build careers as youth pastors at Word of Faith Family Worship Cathedral in Austell, Ga. Located in the outskirts of Atlanta, the church is pastored by their father, Bishop Dale Bronner, and one of the largest in the metro area. 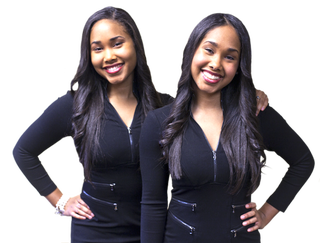 After graduating from college, the identical twins published a self-help book with the aim of inspiring other young people. Double Vals: The Keys to Success in College and Life Beyond serves as a resource for high school and college students on how to strive for success through faith, discipline and hard work. The 175-page guide also provides tips about studying, scheduling, living a balanced life and committing to excellence. The Bronner twins, each of whom maintained a 4.0 grade point average, come from a long line of success seekers. Members of their family own Bronner Bros., a hair and beauty supply company. They intend to carve out their own path to success, focusing on the spiritual side of things and not straying far from the church in their work and deeds, they say. Intent on forging careers in ministry, they became youth pastors at Word of Faith after serving as youth event coordinators, planning conferences, monthly worship and social events, and retreats for their contemporaries with the help of volunteers they recruited. Today the young women, who majored in music, are also directors in the church’s music department. They lead the Ignite Youth Praise Team, teach the 150-voice Ignite Youth Choir and oversee the Ignite Youth Band (performing a mix of contemporary Christian and gospel music). They joined the glee club at Spelman freshman year and had scored leadership roles by their senior year. Initially they had planned to release a music CD after graduation but then decided to focus on their book first. These days the sisters tour the country delivering their message of inspiration. While they have no official ties to the #BlackLivesMatter campaign, Kirstie Bronner says their message is in sync with the movement, whose focus is to halt police brutality against black Americans. Their hard-core spirituality, dedication and discipline enabled them to become co-valedictorians at Spelman. As third-generation Spelman graduates, they are following in the footsteps of their mother, Nina Cobb Bronner, who was part of the Class of 1985, and grandmother, Dorothy Gibson Cobb, in the Class of 1956. The twins’ first instance of spending time apart came their junior year, while they studied music in Milan. Their program, arranged through the Institute for the International Education of Students, did not allow students from the same school to be roommates. “It was the first time we had to travel to get to one another,” Kristie says. “That’s when we learned our love for each other. I was like, ‘Wow, we really like each other and it’s not just because we’re twins.’” Other than the fact that they had to stay apart, she considers their Italian sojourn to have been a great experience. Today the Bronner twins live together in an Atlanta suburb. They are so close, they like the same clothes, books and movies, Kristie says. But come September, the two will likely experience a bit of separation anxiety. That’s when Kirstie plans to tie the knot with her childhood sweetheart, Kyle Foley, 27, a U.S. Air Force pilot. The couple became engaged in February. Lynette Holloway is a contributing editor at The Root. The New York-based writer is a former New York Times reporter and associate editor at Ebony magazine.